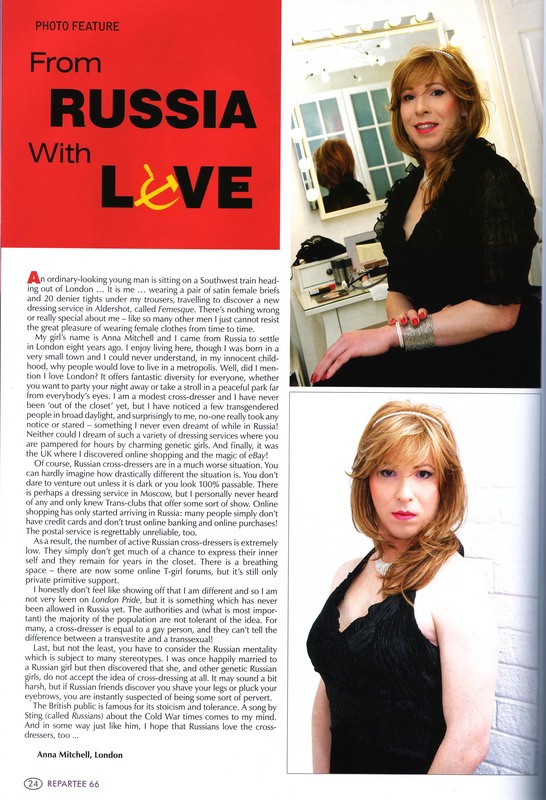 A few years ago in the English magazine for transvestites TV Repartee was published article on behalf of the Russian TV, living in England. Article sad, but we are happy to publish it on our website. An ordinary-looking young man is sitting on a Southwest train head-ing out of London … It is me … wearing a pair of satin female briefs and 20 denier tights under my trousers, travelling to discover a new dressing service in Aldershot, called Femesque. There’s nothing wrong or really special about me —like so many other men i just cannot resist the great pleasure of wearing female clothes from time to time. My girl’s name is Anna Mitchell and i came from Russia to settle in London eight years ago. i enjoy living here, though i was born in a very small town and 1 could never understand, in my innocent child-food, why people would love to live in a metropolis. Well, did 1 men-tion i love London? It offers fantastic diversity for everyone, whether you want to party your night away or take a stroll in a peaceful park far from everybody’s eyes. i am a modest cross-dresser and i have never been ‘out of the closet’ yet, but i have noticed a few transgendered people in broad daylight, and surprisingly to me, no-one really took any notice or stared —something i never even dreamt of while in Russia! Neither could i dream of such a variety of dressing services where you are pampered for flours by charming genetic girls. And finally, it was the UK where i discovered online shopping and the magic of eBay! Of course, Russian cross-dressers are in a much worse situation. You can hardly imagine how drastically different the situation is. You don’t dare to venture out unless it is dark or you look 100% passable. There is perhaps a dressing service in Moscow, but i personally never heard of any and only knew Trans-clubs that offer some sort of show. Online shopping has only started arriving in Russia: many people simply don’t have credit cards and don’t trust online banking and online purchases! The postal service is regrettably unreliable, too. As a result, the number of active Russian cross-dressers is extremely low. They simply don’t get much of a chance to express their inner self and they remain for years in the closet. There is a breathing space —there are now some online T-girl forums, but it’s still only private primitive support. i honestly don’t feel like showing off that i am different and so i am not very keen on London Pride, but it is something which has never been allowed in Russia yet. The authorities and (what is most impor-tant) the majority of the population are not tolerant of the idea. For many, across-dresser is equal to a gay person, and they can’t tell the difference between a transvestite and a transsexual! Last, but not the least, you have to consider the Russian mentality which is subject to many stereotypes. I was once happily married to a Russian girl but then discovered that she, and other genetic Russian girls, do not accept the idea of cross-dressing at all. It may sound a bit harsh, but if Russian friends discover you shave your legs or pluck your eyebrows, you are instantly suspected of being some sort of pervert. The British public is famous for its stoicism and tolerance. A song by Sting (called Russians) about the Cold War times comes to my mind. And in some way just like him, i hope that Russians love the cross-dressers, too.